I've been making Happy Cloud cushions for a while now and I wanted to make a little garland for our new nursery using the same design. I thought it would be a great idea to share this little tutorial so that all my lovely followers can make one of their own too! Mini cloud garland with 6 little clouds. 4. DMC thread for embroidery and to thread the clouds on for hanging. 5. Felt. I used pink, but you can use any colour you want. 7. Scissors, needles, pins & snips. 1. Get all your materials together. Don't forget to make a nice cup of tea or coffee too! 2. Trace the mini cloud design onto your plain fabric using the vanishing marker. I use a light-box, but if you don't have one, press the fabric and template onto a window and trace it on there. 3. Remember to trace the outline of the cloud on the back as well. I use a fabric marker that does not vanish, you will need to know where to sew! Also mark where you will leave a gap when sewing in order to turn your cloud inside out and stuff. A gap of 3 - 4 cm should be fine. 4. Time to do the embroidery. I used a dark brown thread for the mouth and eyes and a dark red for the pink felt cheeks. For the eyes and mouth I used my favourite stitch, the simple yet lovely back-stitch and for the cheeks I used the running stitch. 5. Embroider all six mini clouds. 6. Place your embroidered clouds and patterned fabric together. Facing each other because you will be turning them inside out after sewing them together. 7. Sew all your clouds together and don't forget to leave the gap at the bottom of each cloud. 8. After sewing together all your clouds, cut them all out and snip little triangles all around each cloud, especially in the corners. This will ensure that the fabric doesn't pull too tight around sharp edges. 9. Stuff each of your little clouds with toy filling. I use a chopstick to get the filling into the corners. 10. After stuffing each of your mini clouds sew them shut at the bottom. 11. Thread each of your clouds using a long piece of DMC thread and needle. You can tie a little bead or bell at the ends of the thread if you like. Make sure to thread them towards the top end of each cloud, otherwise they will tilt forward. Ta-da! 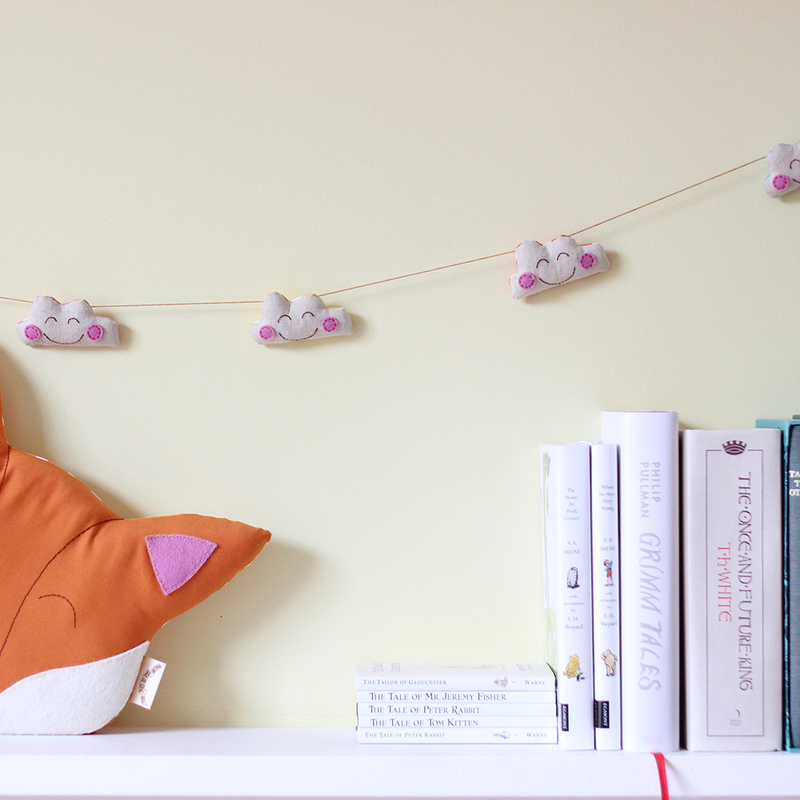 The mini cloud garland in our new nursery. Very exciting! You may not use this tutorial on your own website or blog without the permission of The Fox in the Attic. This tutorial is for personal use only. You may not sell this design. Commercial use is not allowed. Any questions, just ask in the comments below. Enjoy!